The CHIditarod Foundation is proud to be a part of ‘cultivating healthy futures’ with the Gardeneers. Gardeneers is an nonprofit organization that helps schools sustain effective school garden programs, specifically focusing on low-income communities and food deserts. Gardeneers are garden educators that implement weekly garden-based curriculum for students as well as doing garden maintenance when students are not in school. With The CHIditarod Foundation Grant, funding for Gardeneers will be able to expand its school garden support at two Chicago Public Schools located in food deserts, Susan E. Goode STEM Academy and North Lawndale College Prep. Founded in January 2014 by two Teach for America Alumni, Gardeneers currently partners with 20 Chicago schools, primarily in Chicago’s low-income or food desert neighborhoods, to provide regular garden support throughout the growing season. 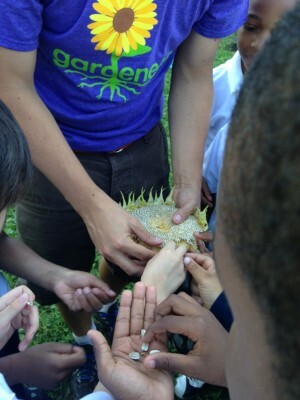 The unique program structure includes weekly visits to the schools by Gardeneers– who have expertise in working with kids and crops– to provide lessons to nearly 1000 students in pre-K through high school. Support from the grant given to the program, Gardeneers will expand the programs to 100 students, all of whom will receive nutritional and environmental education. The revived school gardens have already transformed the school’s space, and the Gardeneers will transform even more students’ eating habits. School gardens can lead to higher test scores, better student nutrition, improved social-emotional skills and increased community engagement. Studies also link well-maintained neighborhood gardens to lower crime rates and increased property values. Gardeneers aims to better not only nutritional issues but also social, community and environmental stewardship.